Among this year's contestants were five former champions, 22 returnees from last year, and five of the ten semi-finalists from last year. The most impressive victory in the first set of ten boards was Ashley Collinson's best-in-tournament finish of 13 spaces past the finish line, followed by Mark Neale's finish at +12 spaces. Both finished ten spaces ahead of the 2nd place finishers at their boards (Ashley over three-time former champ Ray Pfeifer and Mark over defending champion Thomas Browne). John Weber and Wendy DeMarco's wins were two of the three games that ended in ties and were decided by tiebreakers. John Weber beat Inger Henning with ten cards in his ending set to her nine, while Wendy used the eight-space bonus for having the longest set at game end to rocket from 5th place to beat Frank Cunliffe at the +1 space with 11 cards to his zero cards. Wendy's board also had one of the tightest bunching at the finish with all players within a seven-space span. 2001-02 champion John Pack was the only one of the winners in the first set of games to gain a victory during the second set, again with ten boards, moving him up to the top of the leader board with tenpoints. Mark, Ashley, Wendy, and John W. each took a second place, and were joined at nine points by Paul Weintraub, and Alexandra Henning (each of whom had a second in their first game). Brandon Foster had the third of the victories decided by a tiebreaker when he beat Marc Houde five cards to four. Left to right: Nicholas Henning (4th), Tom deMarco (2nd), Marc Houde (1st), Ray Pfeiffer (GM), John Weber (3rd). The third set consisted of nine boards. John Pack won again, remaining in the lead with 15 points. Wendy and Alexandra also won, giving them 14 points. Mark dropped to 4th overall with 13 points. Finishing out the top ten with 12 points after three sets were John Weber, Marc, Nicholas Henning, Alice Trumble, Tony Musella, and Jason Wagner. Alexandra's win was the second one (after Wendy's in the first set) to use the eight space end-of-game bonus to move from last to first, and provided the tightest bunching in a four-player game with all players within a span of six spaces at the finish. Attrition had winnowed the field to eight boards for the final preliminary. John Pack showed that his two tournament championships were no fluke by winning again and finishing with a perfect score of 20 points. Finishing three points back at 17 were Marc, Mark, and Nicholas. Wendy and her dad, 1993 champ Tom DeMarco, finished at 16 points. Filling out the top ten who would advance to the semi-final were Alexandra, Tony, Erika Poniske, and Abigail Cocke at 15 points. Tony decided to play in the Slapshot tournament instead, allowing John Weber to become the tenth semi-finalist. 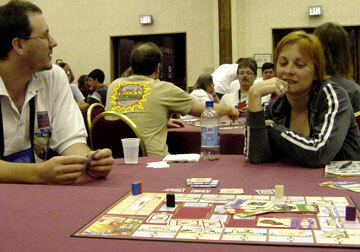 After moving to the quieter environment of the Valley ballroom, the ten remaining players were divided into two games. At one table, Marc won over Mark, Wendy, Abigail, and Alexandra, while at the other table Tom advanced to the final by beating John Weber., Erika, Nicholas, and John Pack. In Tom's game, four of the five players crossed the finish line and Tom's ending set was a tournament-high 15 cards long. Next, the other eight players were shuffled between tables for the last two semi-final games. This time, the Henning siblings were victorious as Alexandra won over Abigail, Erika, and John Pack, while Nicholas outdistanced Mark, Wendy, and John Weber. The best second place in the semi-finals was gained by John Weber, whose +3 space finish allowed him to advance to the final. Abigail's +2 space second place finish was earned her sixth place laurels. The final was a tight game, with nobody running off ahead of the pack or collecting a huge set. The lead changed a few times, with Tom holding the lead entering the last stretch. Tom triggered the end of the game by exhibiting, ending two spaces across the finish line and three spaces ahead of Marc. But the final victor would be determined by the bonuses for the largest two sets. One of the two things Tom needed to happen so as to retain his lead happened when John Weber, who was in fifth place, turned out to have the largest set at ten cards. The eight space bonus was only enough to move him up to one space behind Tom. But the four space bonus for the second largest set was gained by Marc, who had seven cards, and which allowed him to move to three spaces across the finish line, one space ahead of Tom, and into the winner's circle to be awarded his first championship plaque. For the first time, the player of the yellow cards won the most games, tasting victory 15 times, including the final and three of the four semi-final games. The player of the blue cards, who won the most games last year and in 2000, won ten times, followed by red with nine wins, black (most wins in '01 and '02) with five wins, and green with a paltry three victories. For the second year in a row, the player of the red cards had the most last place finishes, followed by black, at 13 and 12 respectively. Again the player of the yellow cards gained the most points toward advancing with an average of 3.71 points/game. The player of the black cards averaged the least with only 2.60 points/game. And yellow again was the color that had the farthest average ending board position, at 0.12 spaces short of the finish line, while green averaged 3.97 spaces short of the finish. On average, 39.3 of the 45 art object cards were bought per five-player game, with a range from 34 cards to the maximum of 45 (which happened three times this year). Four-player games averaged 32.3 cards per game, with a range of 29 to 36. Brian Stallings, Eric Wrobel, Tom DeMarco, and Greg Crowe each won a game with no set at game end. Eric, Tom, and Greg were the only three to do that in 2002, while Greg was the only one to achieve that distinction in 2001. Only eleven little art thieves ventured forth to play Adel Verpflichtet Jr but David Pack of Colorado proved the best collector of the lot ... not surprising considering his dad, John, is a two-time champion. GM Wendy DeMarco went over the rules before setting up three boards. At one table Andrew Wilson triumphed over Daniel Long, Jennifer and Hannah. At the next table Jacob Hebner won over Zack Dunn, Michael Schoose and Daniel Collinson, while at the final table David Pack was victorious over Conel Jaeger and Kaleigh. The three winners were joined in the final by Daniel Long and Zack who had the two best runner-up finishes. In the final, David showed that they must play a lot of Adel Verpflichtet at home by improving from his 5th place finish last year to take the crown. Jacob improved from his 4th place finish last year to take 2nd place this year, followed by Andrew, Daniel Long, and Zack.